Okay, up until now I've been somewhat of a fan of the DC Direct 13" Deluxe Collector Super Special whatever figures. Green Lantern and Aquaman have hit the nail right on the head and while I would have preferred a Silver or Bronze Age Batman the MA version is a decent item. I'll be buying Flash, Shazam and Martian Manhunter but passed on Lex Luthor out of lack of interest and Two-Face because I thought his suit was poorly done. Probably won't go for Catwoman because again I'm not really a fan, but it looks like a good product. 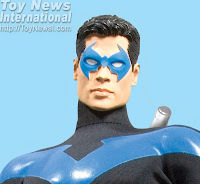 Anyway.... courtesy of Toy News International we have pics of the recently announced 13" Nightwing. Hard to know where to start here, but I'll try. This character selection highlights one of the problems with the 13" scale - to see Nightwing (and Catwoman for that matter) before Wonder Woman or characters like Green Arrow, Hawkman or Black Canary demonstrates that DCD is obviously having trouble making this format work for some of their top tier characters. Brewer has made some reference to this himself. I can understand some villians needing to be done, but getting a character like this before the "Big 7" have been completed doesn't work for me. These issues need to be sorted out, because if it means we see B-listers and endless SuperBat variations instead of the characters we're hankering for, the future of the line looks grim. Secondly, could DCD have picked a character with a blander, more booooring costume? Why a Modern Age Nightwing when there have been several variations of the costume with more detail and interest? It's probably good for production costs but it doesn't make for much to look at. Blah. That's my rant for today. Want to rant back at me? Your comments are welcome! You really have nailed down whats wrong with this character. More Celebrity Inspired DCD Fare!